We hope you find the web site informative and that you find what you are looking for. If not, please feel free to contact us for any more information. The European Forum of Sign Language Interpreters (efsli) represents the interests of sign language interpreters in Europe. 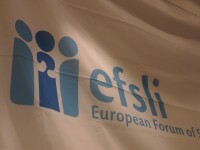 efsli is a European membership-led organisation of sign language interpreters consisting of national & regional associations with individual and associate members. efsli is working towards the higher status of the profession of sign language interpreters in Europe. efsli is a forum where good practice and expertise are shared between all stakeholders in the field of sign language interpreting, such as sign language interpreters themselves, users of the services, educators and policy makers. By bringing together actors from all sectors and levels, efsli aims to further the mutual understanding of the professional requirements for sign language interpreters. By encouraging an exchange of knowledge, efsli aims to encourage the higher status of the profession through proper and continuing education, increasing professional recognition and adequate remuneration. The forum fosters a vision of a European-wide high standard of sign language interpreting services which enables interpreters to fulfil their work in a professional manner. As a result providing equal access to all EU citizens, including Deaf and hard of hearing persons. Essential is the right to professional sign language interpreting services as stated in United Nations Convention on the Rights of Persons with Disabilities (UNCRPD), which was also adopted by the EU Commission in January 2011. Thanks efsli for a wonderful time – we really enjoyed the AGM/Conference – more of the same please! What can I say, as usual a wonderful and enjoyable experience. Congratulations to all at efsli and wish you all the very best for another exciting year. Well done! Efsli and AGM made a strong impression to me; it encouraged me to share my professional experience and to keep close relationships with deaf community.